Announcement, announcement: I've found the best thing on the internet. I know you weren't expecting this today, a day that started like any other for you, but facts are facts and don't try to fight it because today is the day you discover Wikipedia's List of animals with fraudulent diplomas. Rejoice! 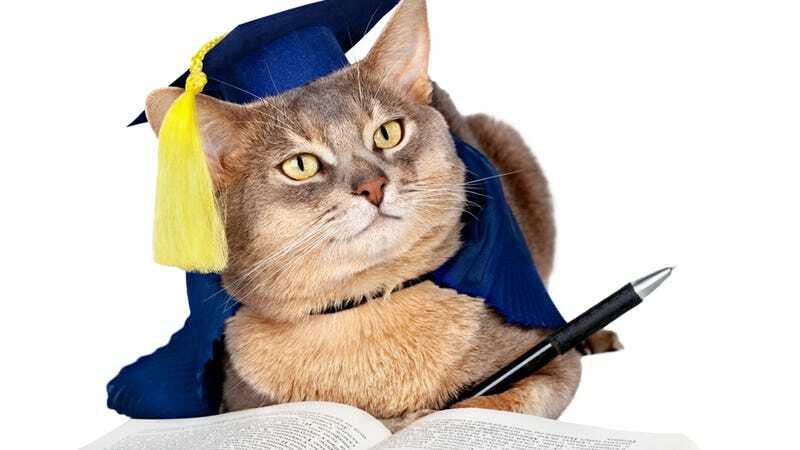 Animals have been submitted as applicants to suspected diploma mills and, on occasion, admitted and granted a degree, as reported in reliable sources. In one case, a cat's degree helped lead to a successful fraud prosecution against the institution which issued it. That cat? That cat would be Colby Nolan, a Texas house cat and MBA from Trinity Southern University. The roster of notable would-be animal academics reads like the cast list of the musical Chicago, if Chicago were Cats. In 1986, Rhode Island real estate appraiser Roy Schaeffer obtained a Certified Real Estate Appraiser (CREA) designation for $75 from the Scottsdale, AZ National Association of Real Estate Appraisers (NAREA) for his cat, Tobias F (for "Feline") Schaeffer. He mounted Tobias' certification above his litter box. NAREA sued in federal court for fraud and "for disparaging remarks about the organization to members of Congress, other appraisers and the media." After two years and $70,000 in legal costs, the judge ruled that no fraud or defamation had occurred. In 2010, Mark Howard QC, a member of the legal team for the defendants in BSkyb Ltd & Anor v HP Enterprise Services UK Ltd & Anor  obtained a degree for his dog Lulu from Concordia College and University. Lulu "graduated" with higher marks than the plaintiff's key witness, who lied that he had attended classes for his Concordia MBA. In the legal community, the story of the witness's MBA is "infamous," and a supervisory management cautionary tale. I could seriously read these all day until the end of time, but you probably just want to stare at the page yourself. It truly is impossible to pick a favorite, so I won't even try. Also, please do not ruin your fun by thinking too long and hard about how awful these predatory diploma mill schools are, and instead concentrate your attention on the brave cats and dogs that are working hard to take down these crooks!